Now listed in my pattern shop, is the pdf pattern and tutorial for making your own jointed waldorf baby doll with a pacifier in the style as shown here. There are many photo’s to guide you through each step of the way. 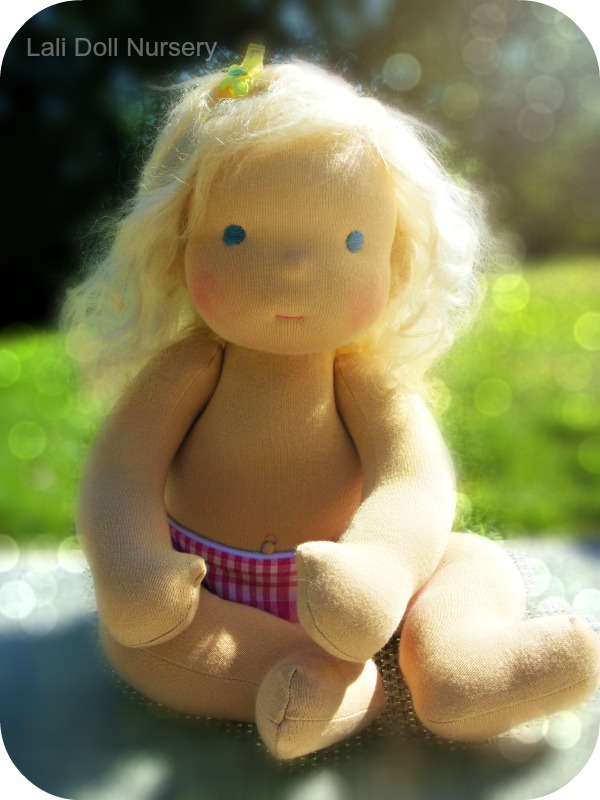 You’ll learn how to roll and tie your own doll head, how to add a magnetic pacifier, how to embroider the facial features, where to get mohair wigs to use on your dolls, like the one pictured here, how to button/string joint the doll, how to soft sculpture the belly button and behind. A tutorial and pattern for the cloth diaper is also included with the pattern. We will also be stocking kits for these, which included everything but the hair, which will need to be purchased separately. Now listed here.